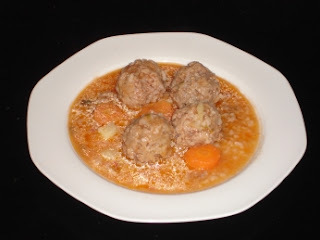 This is another type of meatball - in actual fact, it's a meatball soup. A nice, light and tasty meal. This is another favourite with the kids, in our experience - in fact, even when they grow up, as we have seen with our two sons who always ask for it when they come home in the holidays! Boil 1 ½ litres of salted water in a soup pan. Add the celery, carrots, tomatoes and 1 onion and bring to the boil. Finely chop the other onion. Place the chopped onion and the rest of the ingredients, apart from the oil and the flour, on a large dish. Mix the ingredients, knead them well and make balls the size of large walnuts. Sprinkle the balls lightly with the flour. Remove the boiled carrots, celery and tomatoes from the pan and set aside. Pour the concentrated tomato into the water remaining in the pan and then add the meatballs along with the oil. Boil them for 30 minutes – if the water is reduced, then replace it so that it covers the meatballs. Serve as a soup, adding the carrots, celery and tomatoes if you wish. There are many variations of this wonderful recipe...for example no tomato and plenty of lemon juice.